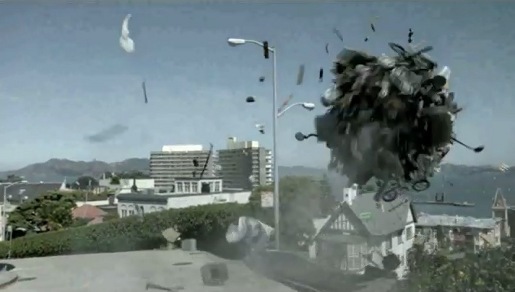 Travelers Insurance is winning awards with ‘Snowball’, its television commercial in the style of the Katamari Damacy game. A pedestrian walking down a street throws himself into a forward roll as he encounters a sale by the pavement. As he tumbles down the street he collects people, objects, motorbikes, an SUV, a wedding party, and a cyclist. The ‘snowball’ finally collapses in front of a public building, releasing its puzzled inhabitants. The voiceover: “When your insurance is in synch, you can roll with anything. Travelers”. The Travelers Insurance Snowball ad was developed at Fallon, Minneapolis, by creative director Kerry Feuerman, group creative director Todd Riddle, art director James Zucco, copywriter James Bray, executive producers Vic Palumbo and Kate Talbott. Filming was directed by Dante Ariola via MJZ, Los Angeles, with producer Natalie Hill, director of photography Toby Irwin, and executive producer Jeff Scruton. Editorial work was done at The Whitehouse , Los Angeles, by Russell Icke with assistant editors Joanna Manning and James Turner, executive producer Sue Dawson and producer Joni Wright. Special Effects were developed at Weta Digital Ltd, Wellington, New Zealand, by VFX supervisor Dan Lemon, VFX Producer Eileen Moran, digital producer Marvin Young, on-set digital producer Kevin Sherwood, digital FX supervisor Chris White, and animation supervisor Paul Story. Telecine was done at Company 3, Santa Monica, by Stefan Sonnenfeld. Music was composed and arranged by staff at Human Worldwide. 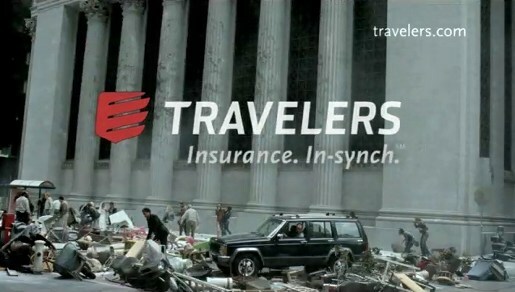 Travelers Insurance Snowball has won awards at the 2007 International ANDY Awards (silver) for special effects), the 2007 CLIO Awards (silver for direction and gold for visual effects), the 2007 New York Festivals International Advertising Awards, (silver for sound design). The ad has been nominated for the Emmys 2007 Awards for Outstanding Commercial. A note of explanation re the Katamari reference. The creative team’s concept bears an unplanned resemblance to the framework of Katamari Damashii, a third-person puzzle-action video game published and developed by Namco for the PlayStation 2 video game console. A tiny prince must rebuild the stars, constellations and Moon by rolling a magical, highly adhesive ball called a katamari around various locations, collecting increasingly larger objects, ranging from thumbtacks to schoolchildren to mountains, until the ball has grown large enough to become a star.